Jesus is a Master teacher and professional golfer of the Spanish Professional Golfer´s Association (PGAE) and is based in Madrid, Spain. He turned professional in 1995 and started out working as an Assistant Golf Professional for the Mataleñas Golf School (Santander, Spain). Four years later (1999), his home-course , “Real Club Golf Pedreña” ( where Hall of Famer Severiano Ballesteros was born) offered him the opportunity to become the Director of the Golf Academy. 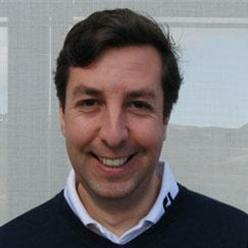 Eager to develop more knowledge and keep growing in the golf business he moved to Madrid in 2004. He then began working for Moon Masters, a nationally recognized Golf Company as the Director of its Junior Golf Programs. Between 2008 and 2012, Jesus worked at the Royal Spanish Golf Federation as a National Coach for the junior squad and he held the position of Director of development for the new “Golf Instructor” program in collaboration with the Spanish PGA. Since 2012 Jesus has been working as the Technical Director of the High Performance Center for the Spanish Golf Federation. Besides his great support to the Spanish Federation, he collaborates with “CANAL + Golf” (The Spanish Golf Channel) in the programs “Canal + Golf Academy”. In 2012 Jesús founded the company JrGolfCoaching. This company´s main focus is to help children develop their golf game through not only great technical support but fun games, illustrations and competitions for their particular level. Jesus, is a TPI Level 1 Instructor in Spain and has assisted with many TPI courses throughout the years. He has also achieved several TPI Certicates as: Golf Professional Level 3 (GP3), Junior Golf Coach Level 3 (JC2), Golf Bio-Mechanics Level 2 (GB2).